Here is a first view of this new design from John Welsford. She is 15'5" x 38", 60 sq ft, her forward and aft hatches lift to form either end of a sleeping tent for overnighting aboard. She is also set up for sliding thwart rowing with short folding outriggers. Built from 4mm ply with 5 planks per side. She will have approx 250 litres of buoyancy and will be stable enough to climb aboard when swamped. She has twin assymetric bilgeboards which pierce through the side decks to keep any water out of the cockpit. The boards will be weighted and there is also a water ballast tank to keep her nice and stable for us older sailors. The cockpit has lots of storage to hand as well as storage in the end tanks. She is reefable from the cockpit, the mainsail stows on the decks for rowing and sleeping aboard. Sailing canoes were hugely popular in the 1880's and the Nautilus line of canoes by Baden-Powell were at the forefront of development. 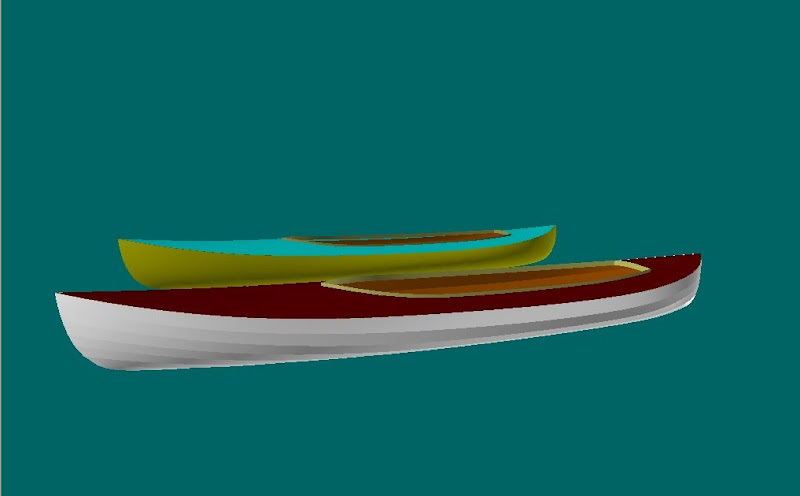 Ever since I stood next to a Nautilus last year and saw how full bodied and powerful it's hull shape was, I have dreamed of a new Nautilus, a proper cruising canoe designed for modern epoxy ply construction. I am just so pleased that John accepted my commission for this new Nautilus. We have wonderful sailing canoes from Solway Dory, and from the US in Bufflehead. This new Nautilus will be a heavier boat, aimed at the more mature sailors amongst us who might, like me, need to sit quietly "in" the hull, just want to potter and perhaps snooze in the marshes. Her rowing element is to ensure she can make over strong tides if the wind dies, the waters I sail in have very strong tides. I do hope you like her, I realise she is more in the tradition of a "Canoe Yawl" such as George Holmes's Cassy , http://www.canoeyawl.org/?p=433 rather than an open canoe. Last edited by keyhavenpotterer; 8th-August-2011 at 09:24 AM. Does it have a leeboard or a centreboard? If it has a leeboard, the pivoting point would appear to be just above the waterline, which makes me wonder if it is a centreboard and has a centreboard casing. 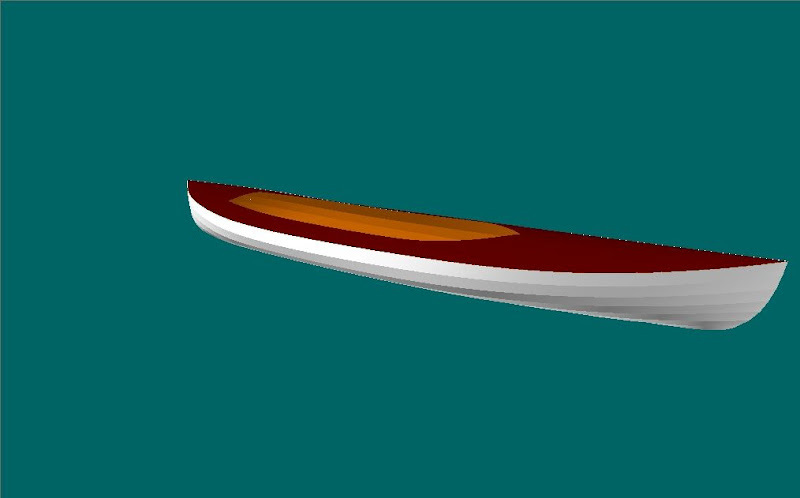 Looking forward to seeing the finished canoe. 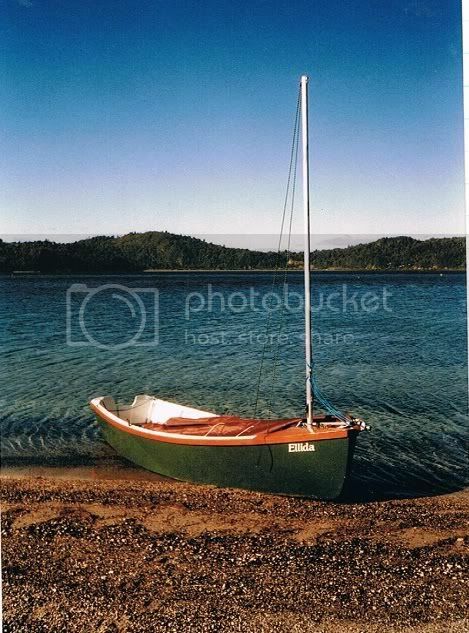 That looks a very nice and sensible sailing canoe Brian. I look forward to seeing her when she is built. Wow, fascinating stuff Brian. I'd just returned from a couple of days canoe sailing and camping earlier this afternoon when I started to read this thread and followed the link to the Wooden Boat Forum. Needless to say my canoe's still on the van roof in the street (I hope ) and my canoe and camping gear's still strewn all over the hall! I'd better stop reading and go and tidy up before SWMBO starts wielding the frying pan! I can't wait to hear more about your new craft though. Thank's the two Chris's and Dave(S). Much appreciate your positive reactions. It's surprisingly worrying posting a picture of your new baby on the forum. Especially with the two Dave's from Solway Dory looking on. If you would like to read more on the sailing canoes of the 1880's, there are two books which are a must read. The first is Dixon Kemp's Manual of Yacht and Boat Sailing. First published in 1878, it's over 600 pages long and has over 90 pages on sailing canoes. It's available second hand and makes a great birthday or christmas present http://www.amazon.co.uk/Manual-Yacht.../dp/0907069568 The new one listed here at £31 is a fantastic bargain. Just yesterday when I looked they were £50 to £70. The one listed is the 8TH edition edited by John Leather and is the best one to own. I think it was also available on-line but I cannot find it just now. Hi Brian, I'm really intrigued by your Nautilus project and was wondering if you have a timescale for completion of your own boat? Maybe it's impossible to say this early but as I have no experience of building a canoe myself I have no concept of the gestation period of a craft such as this. Is it unrealistic to hope to see the boat next season or is it a much longer term project? I for one would love to hear of your progress during the planning and building phases (not to mention once the boat's on the water). Timescales are never easy, but here's where we are just now. John is flying to the US in about a month, and has this window for designing Nautilus. He is fully booked up with other work when he returns, so the plans are due for completion either within a month. They might not be, designers need thinking time and that may put release back, but just now, John is actually drawing the design. So a boat on the water next season is a possibility. 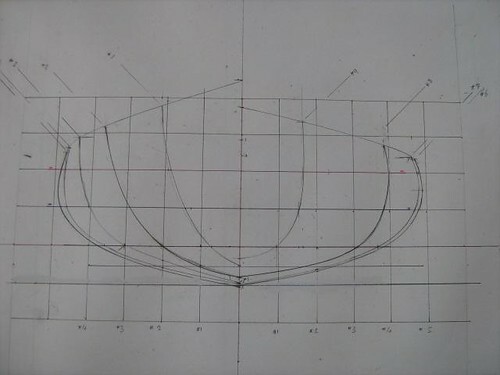 There is a strong possibility that we will also be able to have the design digitised so that a CNC machine can be used to cut the boat as a kit. This would be a building jig, the moulds, hull planks and decks. It will be possible to build straight from plans, many people build using John's designs, often first time builders. 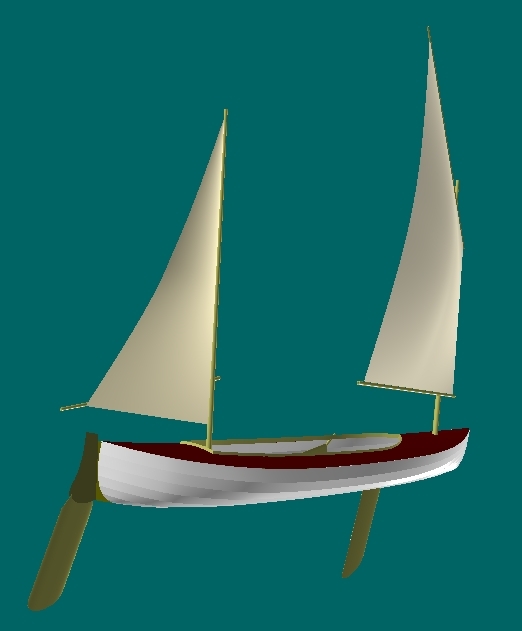 Spars will be alloy tubes ex-stock from suppliers, sails from one's favourite sailmaker, or make your own as I have done before using SailCad4 to design the sail, and output sail panel shapes. So, yes, hopefully we will have a boat to sail next year. John has just sent the body plan for Nautilus and with his permission here it is. That looks like quite a capable hull! Tumblehome seems more pronounced than in the first sketch. Are you still aiming at 5 planks per side? A very interesting project you have on your hands. Very curious where this is going to lead to. John's not said otherwise, and is now drawing full size sections. It's a very shapely hull and looks a candidate for strip plank and take off a hull mould when she has been trialled. Last edited by keyhavenpotterer; 25th-August-2011 at 01:13 PM. John's sent the first set of drawings through. These are the mould sections, building jig and general arrangement. She's such a curvy shape that John has not been quite happy with lining off her hull in 5 or 7 plank layouts, so as I suspected it will be strip plank, 30mm x 8mm strips which will also be used for gunnels, frames, stems and such. My son Ed has a supply set up from Devon of very fine yellow cedar in full length planks, 4" wide by 1", 2" or 3" deep. Can anyone help with approximate amounts of boards, or strips, I will need to cover the hull. Our first calculation come out at 6 cu ft. It's about £40 cu ft so not too bad in cost terms if we are about right on quantity. The hull is just under 16' and 38" wide for comparison. She's such a curvy shape that John has not been quite happy with lining off her hull in 5 or 7 plank layouts, so as I suspected it will be strip plank, 30mm x 8mm strips which will also be used for gunnels, frames, stems and such. I guess that will make for quite a beautiful boat, although very different than the 4mm ply, 5 planks per side you set out from. Makes me curious about its weight. Will it be glassed inside and out? I know you were aiming at a small trailer anyway, but will it still be "car-topable" for those who would like that? Hi Japp, our thinking followed these lines. Even a very light boat is a handful to lift on and off the roof. I have been happy lifting a 13'6" open very light MacGregor on and off the roof, or at least onto my lowered Kari-Tek bars. I find the bulk and difficulty of lifting my decked Shearwater leads to me finding another person just to help flip her onto the bars. She is 40" beam and just fits my Kari-Tek. It would in fact be easier to tow and launch her from a lightweight trailer. So when we started discussing Nautilus and that she should follow the bloodlines of the heavier cruising canoes of the 1880's we let go of the idea of an easy single handed roof top sailing canoe. However, my own sailing takes place from my dinghy park space at Keyhaven. So it would make sense to car top her to Keyhaven and then keep her on a lightweight trolley in the dinghy park. So her beam at 38" means she will fit my Kari-Tek rack. So I would envisage car topping her with a lift onto the roof with my son and then off again at Keyhaven. This method will also work for travelling to cross channel events such as the Morbihan. If I were popping off to small UK events regularly I think a lightweight trailer would be far the easiest. In fact with the dinghy space costs becoming so expensive now I may well just trailer her from my garage. Her hull weight may be comparable to a grp boat. SD build the Shearwater as GRP and as strip plank so they would know what the weight differences are. Bufflehead can be built very light and I know Axel can carry his over his shoulder. Trouble is I need a heavier more stable platform for my local sea conditions. John really has designed a different boat to the current style, and does indeed use the 1880's cruising canoes as her inspiration. 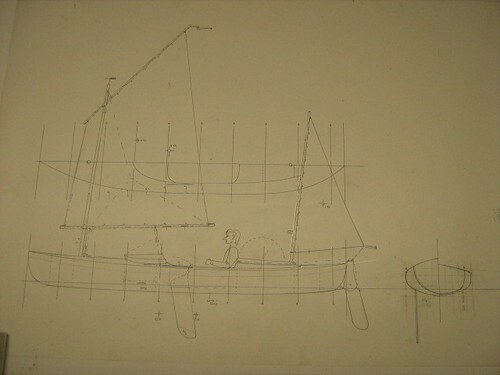 The general arrangement drawing shows her with a 30kg water ballast tank by the helm's feet and also 25 kg under his seat, plus 5kg in the ends of each bilge board, so that's 65kg in total. So even with the water ballast empty and seat ballast in the boot of the car, she is probably best thought of as best suiting trailering. I now understand why John says a medium weight person should be able to stand on her gunnel, and after going through the maths I am now beginning to believe him. So, with water ballast and seat weight removed she will be like a lightweight dinghy to move about, and with both in place she will weigh about the same as the 12' Scows I have been racing for the last 10 years. Last edited by keyhavenpotterer; 1st-September-2011 at 09:53 AM. My Shearwater from Solway Dory is listed when stripped, ie hull only, as weighing approx 90 lbs, 41 kg. She is car topped by many people including myself. Since Nautilus is same length and slightly narrower then she should weigh about the same. Both are decked sailing canoes, and plywood is much lighter than grp. Not sure of comparison between ply and strip - anyone know? Built in foam and epoxy she could well be lighter, so possibly car topped as easily as Shearwater. Brian , the Nautilus looks like another great plan from a kiwi legend designer . 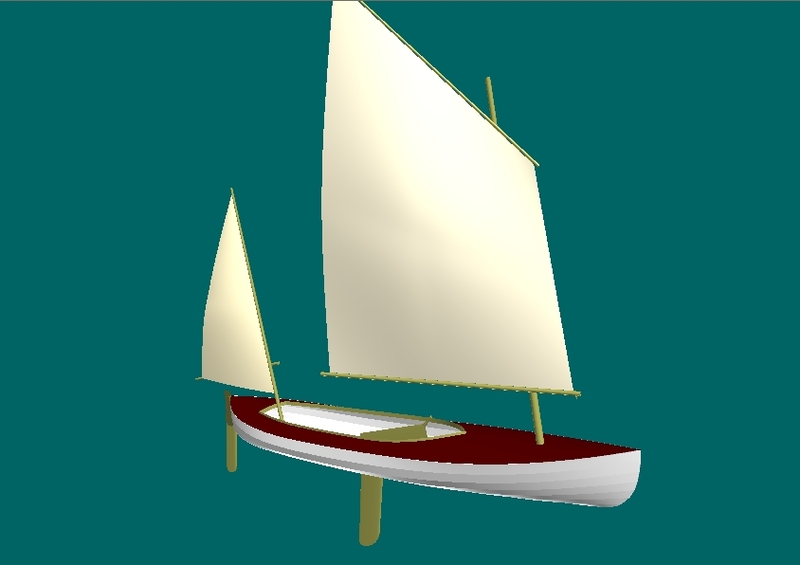 I built a sailing dingy of John Welsford design ( golden bay ) with standing lugsail, a few years ago ( about seven ) which myself and kids have had many great trips. I'd love to build one of the bigger boats like the JW whaler one day and have a trip around the Marlborough sounds. Last edited by Tomo-hawk; 2nd-September-2011 at 01:21 AM. I've been a lurker on the Wooden Boat Forum and have enjoyed reading the discussions and debate surrounding Nautilus on there. Would it be cheeky to request an update on progress with the project here on SOTP Brian? Thank's for your interest Jurassic, it's good to know others are interested in our project. John is away on a major trip to the States. Not back till mid Oct and I know he is going to be very busy when he does get back. That's fine because I don't want to rush in any way. A new project like this need "thinking" time. I have been reading about building in strip plank and trying to get my head round the issues. Seems to need very accurate work when filling in between two different plank runs. ALL advice welcome. I have sorted out somewhere to build her and a building jig. Mind you the jig has an unfinished hull on it. It's an Oughtred Snipefish rowing hull which is complete in building terms and I will be epoxy coating and painting it in the next weeks. We have all the components to build a second hull ready, so hopefully can get that built and then start the Nautilus later this year. It's a freezing cold building though. So not much development of the design to report just yet. Can anyone help with how much cedar I need to order for a 15'6" x 38" hull? Excellent Brian thanks for that. I can't help in the slightest with the technical stuff I'm afraid, my interest is restricted to marveling at what those with more talent than I can achieve. the great thing about strip builing is that you just do the same thing again and again and again until the strips are all in place. The first infill strips will take you a little while, but you soon get good at it. Will the boat be varnished? If so, you'll know and see every tiny fault there is but no-one else will even notice them! 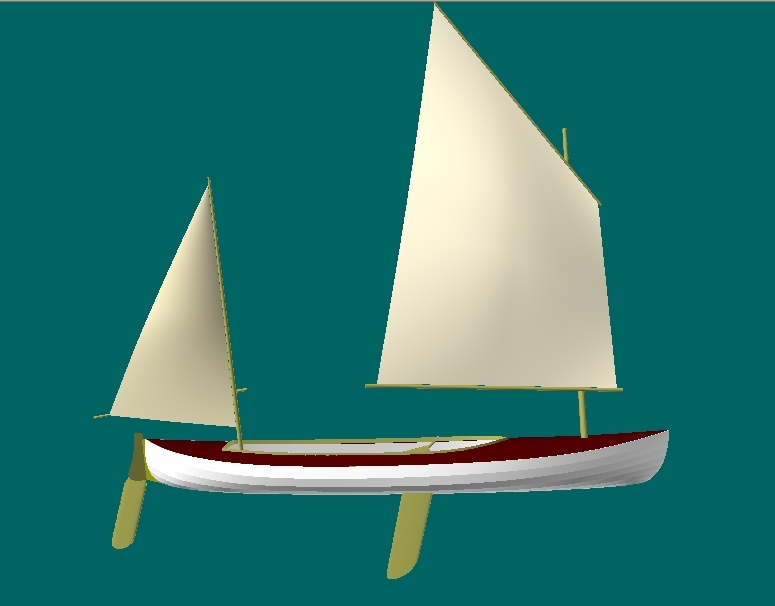 FLO-MO, http://flo-mo.weebly.com/boat-design-studies.html , has very kindly created some 3D renderings of Nautilus. Both a smooth skin cedar plank version and 7 plank plywood version are shown. John Welsford and I are just now discussing our approach to a plywood hull. I think I prefer a stitch and sheath hull built around a framework made of the cockpit bulkheads and cockpit sides/bilgeboard cases. Something similar to CLC's planklap system might enable a clinker look to the top 3 or 4 planks. FLO-MO has now added a Nautilus slide show to the bottom of his design studies page. Nautilus looks great in 3D Brian, how long until construction commences? I think it will be when the weather warms up in the spring. The building I will use is about the coldest on the planet. 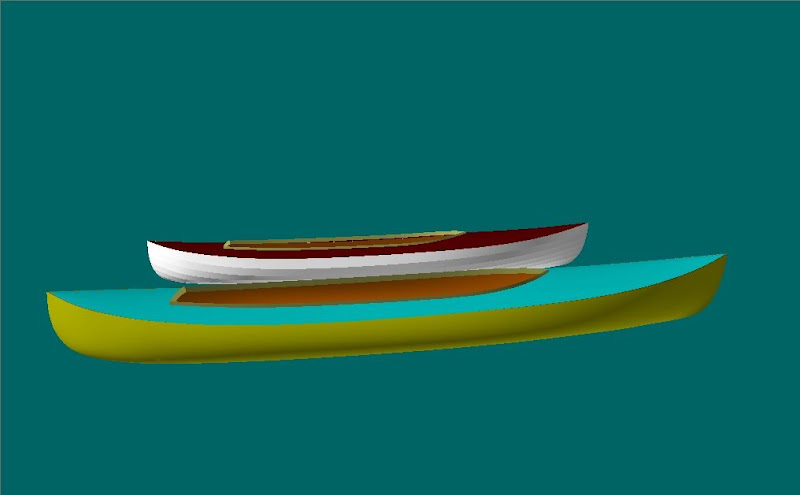 Here's a view of the hull from - astern on the left, astern and ahead in 7 plank - and on the right from ahead. She's very shapely. 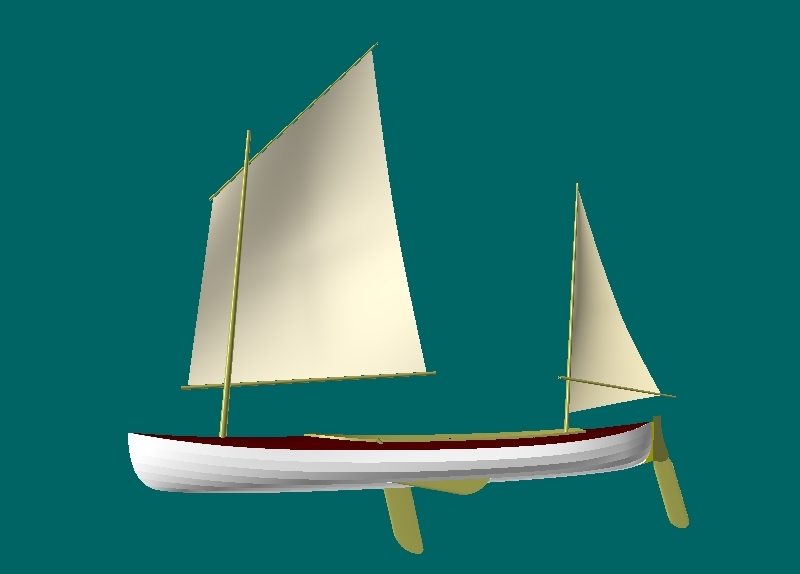 Cassy, by George Holmes, is one of the 1800's sailing canoes which inspired our new Nautilus. Gavin, at http://intheboatshed.net/ has blogged today that a new Cassy will be launched on Dec 7th at the Lyme Bay Boatbuilding School. So I look forward to seeing in the flesh then. FLO-MO has added the rig and foils.